Wanna Chat? What about Now? Now? Now? How about Now? Is your website turning into the Times Square of today’s website homepage? A constant barrage of invites to chat blinking away, distracting your attention. Is it noise? Is it just smart conversion tactics? Chat is getting a bit gratuitous. Your website wants to chat with me, and it won’t take no for an answer. Like a needy significant other, they are constantly trying to steal your focus away from your core objective. Research. That is FOUR invites to chat on the homepage of a website. You might be surprised to know this, but not all consumers visit your site solely to chat. They want to educate themselves on your store, inventory, product, specials, offers, location, people, and more. Some do end up chatting for quick answers, and that is great. 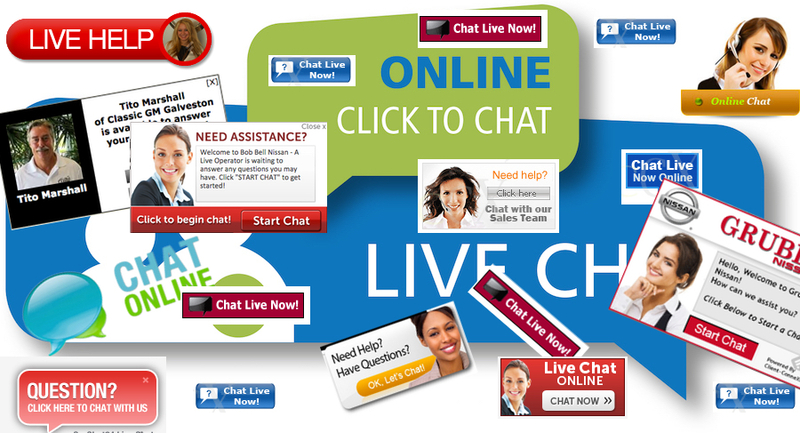 Live chat is an excellent tool to make that connection. However, I don’t believe four active offers to chat on one page is acceptable. The majority of sites I see have at least three offers. Again… probably too much. I doubt data exists to say I’m correct either. It is consumer preference. Maybe the concept is… the more you ask someone to chat, the more likely they are to do so. Ask them too often, though, and I would assume you turn some off. From static images in the header (which I like) to the pop up window offer that slowly drops down across the homepage to the bottom like an unnerving lazy eye on the site’s face (which I don’t like), these chat offers come in countless forms. Some peek out. Some have faces. Some have multi-colored and multi-font call to actions. Some have images. Dealers are abusing the use of these chat invites to obtain customer information when we should realize that a good website experience doesn’t always need to lead to a lead. Websites should meet and exceed your customers’ expectations, not overwhelm and inundate their senses. A good website experience doesn’t always need to lead, to a lead – would you agree? I like chat. I like click-to-call ability. I like texting and emailing and any single medium in which an online shopper chooses to communicate with you (like Jerry Thibeau’s new TalkOptions platform which offers all of the above in an unobtrusive manner), I like giving shoppers a choice in how to contact the dealership if they so choose. I don’t like any tool that forces itself on the shopper. Distracts their attention, or pulls their focus from their research. This could open up as a discussion about how many conversion tools are too many. We could challenge each other as to how many specials/banners/advertisements we should be deploying in every crevice of our sites. We could debate about how many call-to-actions on homepages, SERPS, VDPs are a distraction and are actually counter-intuitive to generating leads. These are the examinations we should be having as an industry. And we can begin with the conversation with today’s brazen live chat requests that are more high-pressure than any used car salesperson ever is. Take a look at your website. If you feel your offers to chat are too much, ask your chat provider to tone it down a notch. Chat is a necessity for every single automotive website. You need it. You just don’t need to overdo it. How many offers to chat would frustrate you? How much chat is too much chat? Comment below or better yet, join us in the dealer forums with several comments already.